Hey, y'all! I know it's been forever but I'm back and I'm trying my best. Aren't we all? To make up for it, I have some amazing news! As you might have seen on Instagram, I booked the most killer project. There is a new restaurant opening in the Bywater of New Orleans (hopefully by this fall) and I am designing the interior! The space includes a mezzanine and the most beautiful exposed beams, AND there is a roof deck bar. This is my first commercial project and I could not be more stoked. The roof has a beautiful view of a clocktower, but it's very secluded, which gives it potential to be a perfect oasis. As for the restaurant, it's a completely blank slate! Isn't that built-in nook amazing? I got big plans for that baby. I wanted to include y'all in the design process as we create both spaces. At my first meeting with Stephen Nutting and the chef, Christopher St. John, we discussed both of their aspirations for the restaurant. Shortly after, I dove into Pinterest and all my favorite design blogs to compile 3 distinct mood boards for each space. I wanted each to have strong character to establish a theme. Once that theme is chosen, my plan is to mix elements from the other two moods so it isn't basic AF. Anyways, TIME FOR THE DEETS. 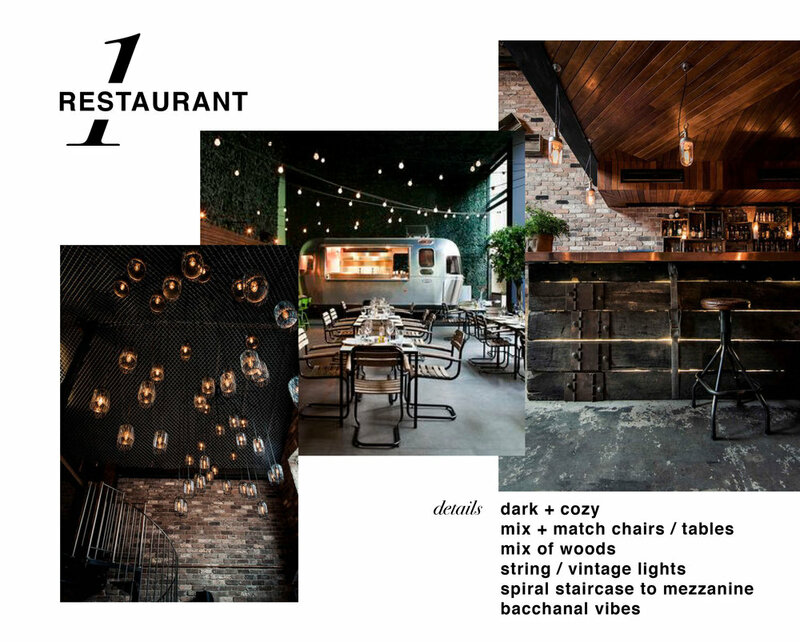 The first mood board is your typical New Orleans industrial warehouse bar. I wanted to include it because the space IS a warehouse and there are fantastic pieces in here, like those chairs and the copper bar! It's masculine and dark and cozy and makes me want to drink whiskey straight and light something on fire. The roof deck would incorporate all those vibes with mixed rusted metal and wood seating, but with a TON of greenery to lighten up the space and add that oasis feel. The second is California-inspired. Our chef is planning a healthy, vegetarian and vegan-focused menu which immediately made me think West Coast. White tile, light wood, brass elements, greenery and, of course, some Persian rugs and brass elements. My friend Adrienne recommended using a grab-n-go display case as a hub for merch and other branded objects, which I'm obsessed with. This iteration uses built-ins on the roof deck with ample room for plants and some geometric furniture. The third is my favorite because it's the most swanky, obviously. Tufted leather built-in seating, brass detailing, custom booths, velvet chairs in a bold color, and patterned tile to make a statement. This is what dreams are made of. Also those leather chairs for the roof deck? I need them in my daily life. The roof deck will feature a green wall in this iteration, which will hide the drab, beige roof on the side of the deck but won't cover the clock tower. The team picked their favorites and we are starting with the roof deck! We're making great progress, but of course, every project has its' hurdles. Our team is small but mighty, and it's been wonderful to tackle this project with such positive, hardworking people. Thanks for reading if you made it down here! I'll have more updates on furniture choices and mockups soon!